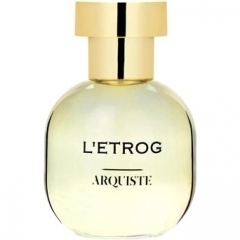 L'Etrog is a perfume by Arquiste for women and men and was released in 2011. The scent is citrusy-fruity. It is still in production. Highly aromatic citrus with green/woody nuances. Opens with massive, juicy lemon/citron, somewhat like Allure EB and for quite a while remains just that. It gets subtly sweeter as the date comes in, followed by a nice clean vetiver. Pretty simple, quality "cologne"; soft, fresh, safe. I've worn Arquiste L'ETROG several times now, having acquired a small bottle from OpenSky for the third round of Chandler Burr's Untitled series. From the beginning, this perfume reminded me of Histoires de Parfums 1873 (Colette), and even now, knowing that it is not the same, I cannot wear L'ETROG without thinking immediately of 1873. It must be the combination of grapefruit (listed here as citron, but to me it smells just like grapefruit! ), including juice and peel, with a candied sweetness, imparted here by dates, there by caramel, which is causing the association in my mind. I find the quality of the two compositions to be on a par--this really does smell "niche", if that means anything--and I might consider adding a bottle of L'ETROG to my collection if I did not already have one of 1873. Even in a side-by-side comparison (before the reveal), I managed to convince myself that the difference I was smelling was due to batch variations! This is nice, no doubt, but not compelling for me. It's a somewhat quirky cologne which moves toward the gourmand realm without quite going all the way. This sort of composition really defies categorization, and I only encountered it twice before: in 1873 and in Bond no 9 CONEY ISLAND. I consider these three perfumes all to be "event" or "novelty" scents, not something with any obviously appropriate applications, but which are enjoyable nonetheless to wear. Write the first Review for L'Etrog!